This quick and easy body butter is based on pure organic unrefined virgin coconut oil, the kind that still retains a subtle coconut fragrance. Use this oil to hydrate and restore dry and irritated skin. Warm coconut oil until it has soft texture, coconut oil becomes liquid at 76 degrees, a warm kitchen will give you the right temperature. 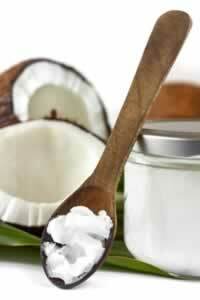 Cream essential oils, vitamin E, and coconut oil together with a kitchen fork. Store in closed container in a cool place. It gets rock hard in the refrigerator, so storage temperature is important in retaining that creamy, easy to spread consistency.